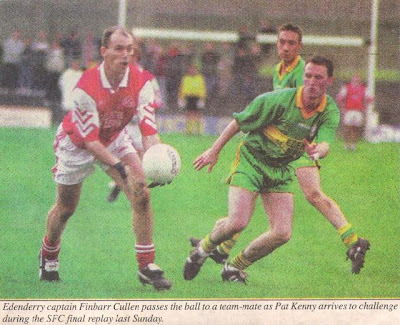 Following on from last weeks ‘Best XV’ players that he had played with for both club and county, former Offaly captain Finbarr Cullen sat down to discuss the ‘Best XV’ players he played against. There are just five counties represented on the team with Meath dominating the selection with no less than six players. A total of four Kerry men made the cut with Kildare (2), Down (2) and Tyrone making up the rest of what looks to be a formidable team on paper. “It wasn’t easy picking this team to be honest. There are some big names missing from it in fairness. I played against some great players like Paul Barden (Longford), Jarlath Fallon and Michael Donnellan of Galway, Dessie Dolan with Westmeath and Kevin O’Brien of Wicklow but ultimately in the forwards I’ve gone for lads that I man marked on a few occasions". I couldn’t look past Declan O’Keefe for the number one position. He was very agile, so dependable and he had a great kick-out too. Robbie O’Malley was a brilliant leader for Meath and a terrific reader of the game. I heard him numerous times on the pitch and how he spoke to his players. He was excellent. What needs to be said about Seamus Moynihan? He was simply a class player and again I’m going to say a great reader of the game. It is such an important attribute. Another fantastic player that I played against. Darren Fay physically was one of the strongest players I ever played against. He was a superb player. His pace as a wing back was truly exceptional. Graham Geraghty scoring record from half back was brilliant and that’s probably why he ended up in the forwards. Another man that was a brilliant leader for his team. Glenn Ryan was brilliant at reading the game and just so dependable. You knew he was going to give it everything. My last defender is Martin O’Connell of Meath. He was an exceptional footballer and he made the team of the millennium. No other explanation needed! Where do you start when you want to praise Darragh Ó’Sé? He had everything a midfielder could possibly want. His distribution always stood out for me because he just never gave the ball away. He was the ideal all round midfielder. He captained Ireland when I played with him and he was brilliant. Johnny McDermott was a great fielder of the ball, his work rate was excellent and he was a great leader. One of the most talented players I played against. Maurice Fitzgerald had two great feet and he was a great man to get scores. He was brilliant at reading the game too. One of Tommy Dowd’s best attributes was his ability to win his own ball. He worked tirelessly and he was physically very strong too. He never gave you an easy day. A natural forward. John Doyle had brilliant ability and he was so genuine and honest. He was a great free taker and a top player for Kildare. His All-Star was well deserved. A compliment I could give Mickey Linden is that I actually learned so much from marking him. He made terrific runs, was very clever, he had two great feet and he was very accurate. He was one of the greatest ever players. Peter Canavan was just so dangerous, so elusive and so hard to mark. He was extremely intelligent and his all round game was exceptional. I’d probably have to say James McCartan was the hardest man I ever had to mark. He had a phenomenal low centre of gravity and unbelievable pace to go with it. His work rate always stood out too.